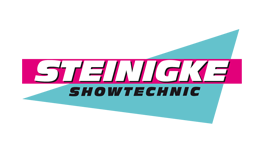 Steinigke Showtechnic is one of the biggest distributors for show equipment in Europe. With our brands Eurolite, Omnitronic, Futurelight, PSSO, Alutruss, Omnilux and Europalms we do primarily cover the fields of light, sound and decoration. With Dimavery we have our own brand for musical instruments. Our customers are retail dealers, wholesale dealers, technical gear providers, rental companies, outfitters for clubs and stages, stage engineers, booth builders, marketing chains, cities and communities. Our aim: a collective success with our partners. Therefore, we are constantly developing new and high-grade products at fair prices. Steinigke products can be found all over the world. Whether on live stages of world stars such as Rihanna, 50 Cent or national acts like the German band Brings, whether in discotheques, theaters, training and youth centers or at stores and booth construction – our products are meant to be for both professionals and amateurs. It applies to all, it applies to you.